Wishpond is a service that provides multiple tools designed for scaling a business. Taken together, you have access to a powerful system that’s appropriate for both start-ups and businesses that are ready to grow. Wishpond fills in some of the gaps that marketers face when it comes to areas such as landing pages, contests, forms and lead management. While there are many solutions to each of these issues, it’s difficult to find a way to manage them under one dashboard. Wishpond is designed to help you do just this. Let’s look at some of the features of Wishpond to help you decide if it’s right for your business and also list any current Wishpond discounts (if available). One of your biggest challenges when it comes to generating leads and sales are your landing pages. Whether you’re sending traffic from a blog post, social media post, email or paid advertisement, the quality of your landing page is one of the main factors for conversions. Landing pages don’t just need to be professional and engaging, they have to be ultra targeted towards your particular audience. Today, it’s also essential that landing pages are mobile-friendly. One of the most impressive features of Wishpond is the ease with which you can quickly create attractive, mobile-responsive landing pages. There’s no need to have any coding knowledge. The system has a user-friendly drag-and-drop method for adding and editing whatever elements you need. There are more than 100 templates, so you can easily create a landing page that’s suitable for any industry. It’s important to test your landing pages. When you can create them very quickly, you can conduct lots of A/B tests on things like headlines, layout, colors, and text. This helps you improve your landing pages and get higher conversions. Since the pages you create with Wishpondare fully responsive, they look just as good on mobile devices, laptops and desktops. While people have differing opinions on popups, there’s no question that they can be effective. There are a multitude of possibilities for popups and Wishpond gives you many choices. You can choose where and when visitors see your popups. You can use Entry, Exit-Intent, Page Scroll or Timed popups (where the popup appears after a certain amount of time). You can test different popups and find out which work best for you. As with all of Wishpond’s features, you can create popups in minutes without having to worry about coding. You can use forms for a variety of purposes on your website. Getting people to fill out a form is a simple call to action, but one that can have a big impact on your success. For example, if you want people to enter your contest, sign up for your mailing list, request a free sample or ask a question, it’s important that the form is highly visible, professional looking and easy for people to fill out. Even a minor glitch on a form can discourage people from bothering with it. Wishpond has many templates for forms, no matter what you need them for. Contests are another powerful way to build your business. This is an especially effective tactic on social media sites such as Facebook. Contests, however, can be confusing for people who aren’t coders and you can spend many hours trying to figure out all of the technical details. Wishpond has a suite of Facebook Contest Apps that make it easy to create a variety of contests. With 10 contest apps, including Sweepstakes, Photo Contests, Pinterest Contest, Instagram Hashtag Contest and Coupon, you have many choices for engaging your audience and creating viral content. Everyone loves to win things and contests are a great way to get more likes and followers as well as people sharing your posts. Building an email list is one of the best ways to scale your business. To do this effectively, however, it’s necessary to send relevant and targeted emails. As your list grows, it’s helpful to segment it into different categories. All subscribers aren’t the same. The bigger your list gets, the more important it is to segment it. Wishpond lets you score and segment leads automatically based on their actions and personal information. You can set up customized drip campaigns that will be highly targeted. You can also set up the scheduling for your emails. This type of system really frees up your time. Rather than having to sort through emails manually, Wishpond takes care of everything. For example, you may want to set up several different email campaigns where subscribers receive 3 emails per week. With Wishpond, you can set up the scheduling and content ahead of time and the emails will be sent out automatically. Leads are the lifeblood of any business. Once you get leads, however, you have to know how to make the most of them. You want to know as much as possible about leads so you can meet the needs of all your prospects. Wishpond provides a simple way to track and manage your leads. You’ll be able to see exactly what actions people completed, such as website activity and the opening of emails. Being able to observe each touchpoint on the buyer’s journey helps you create more effective campaigns. For example, you may notice that certain web pages create more conversions or certain email subject lines give you a higher open rate. Wishpond also has a lead scoring system that lets you rate leads based on the likelihood that they’ll actually buy something. Wishpond also integrates with many other tools you and your team may be using. You can sync your leads database with your CRM, email marketing service, project management software and other tools. Some of the integrations include Salesforce, Base CRM, Highrise, InfusionSoft, Insightly, MailChimp, Constant Contact and many others. Wishpond has three plans that cater to different-sized businesses. Starting Out: $49/month. This plan, which provides unlimited landing pages, social contests, popups, email campaigns and custom CSS, gives you up to 1,000 leads. Rapid Growth: $199/month. This allows you to have unlimited user accounts, personal coaching and premium customer support. All plans are billed annually. Wishpond offers a free 14-day trial to let you test drive the system. There’s also a demo available on their website. The are no active Wishpond discounts at the moment. Until something pops up (around Black Friday/Cyber Monday time) you are welcome to take advantage of our bonus offer. Sign up for Wishpond using our link here and get 3 months of our favorite email marketing service, Aweber, for free. Contact us for details. 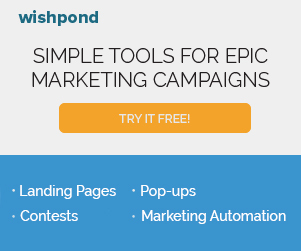 Wishpond is a useful service for anyone who wants to grow their business with the most efficient online marketing tools. The ability to quickly create landing pages, popups, email campaigns and contests can help you grow your social media presence and email list and get better conversions from your offers. Anyone who is serious about scaling their business should take a close look at Wishpond and take advantage of their free trial.